Place: Romania, USA, Europe, Asia. The main characters: Richard Stein, Liviu Delianu, Les Paul. 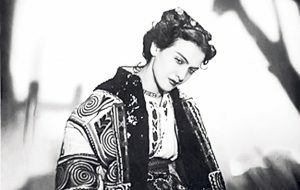 Actors: Romanian performers Maria Tanase, Silvan Florin, Bela Guitarist, Maria Lataretsu, Jean Moskopol, American singer Mary Ford, French singer Edith Piaf, Soviet singer Alexandra Kovalenko, Serbian soloist Zvonko Bogdan, Israeli Yardena Arazi, Belgian band “Vaya con Dios”, ensemble “Orizont” from Moldova, Kazakhstan boys-band “Alau”. In the 30s of the last century, when tango, foxtrot, waltz, and rumba dominated in restaurants and public places, Romanian composers of the light music created a new genre called “Romanian song” or later “popular song”. An important place was occupied by “Sanie cu Zurgălăi” – a song that is considered by many as a folk one. This beautiful melody has its own interesting story. 1936 year. Bucharest. Two Jews, composer Richard Stein and poet Liviu Delianu (Lipa Kligman) created the song “Sanie cu Zurgălăi” (“Sledges with Bells”). The song was written specially for a famous singer Maria Tanase, but she did not dare to sing it that time. Political instability in Romania during the period between the two world wars led to intensification of anti-Semitism and creation of extreme-right nationalist parties, such as the Iron Guard. Coming of the Nazis to power in Germany also provoked anti-Semitic measures in Romania: laws that deprived most of the Jews of citizenship and forbade marriages between Jews and Romanians were adopted. This affected the fate of creative personalities as well. Sylvian Florin was the first who performed the new song written by two Jews at this difficult time. His name and photo are on the cover of the original score, in which the author’s name is hidden behind the signature of S. Richard instead of R. Stein. Unfortunately, recording of the song in his performance is not kept. 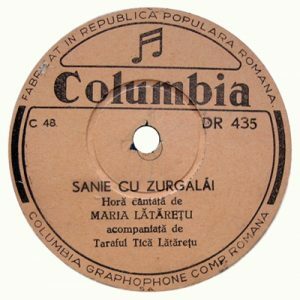 The earliest record we have was made in 1949 in the folk Romanian style, where the vocal part was performed by the folklorist singer Maria Lataretsu. The name of the composer R. Stein is not mentioned, as if music and words have long have become folk songs. Perhaps the song by that time became so popular that it was really taken for a folk one. The version performed by Maria Lateretsu was different from the original. It was deliberately stylized as the Romanian folklore. Fortunately, the original version exists in interpretation of a remarkable singer Bela Guitarist (real name Bernard Dulzer) and is considered closest to the source. He also did not know the author, and therefore there is no mention of Richard Stein on the envelope of his record of 1960. The tune was also used in the fight against the communist regime in Romania. It happened in 1947, when the Romanian variety artist Jean Moskopol left the country because of the regime persecution. As an employee of the Radio Free Europe / Radio Liberty in Paris, he wrote a collection of verses in which he criticized the Soviet authorities, the leaders of communist Romania and the USSR. Two songs were put on the melody of “Sanie cu Zurgălăi”. In 1953 an American guitarist Les Paul, working in the styles of jazz, blues and country, writes his new song Johnny Is The Boy For Me (“Johnny, you’re my boyfriend”) under this music, based not on the original composition of Richard Stein, but on its version with the chorus performed by Maria Lataretsu. The text of the new song belongs to Paddy Roberts and Marcel Stelman. The first singer was Maria Ford. Publication of the American weekly Billboard on June 6, 1953, announced the release of Johnny Is The Boy for Me, released by Capitol Records (No. 2486). The song becomes a hit. A few months later, the famous French singer Edith Piaf learnt about this song, and records it on December 24, 1953 with the French text “Johnny, tu n’es pas un ange” (“Johnny, you are not an angel”), written by Francis Lemarque. The author of the music is Les Paul. Plagiarism is obvious, but this is the case when it made the song world famous. The real music writer, Richard Stein, filed a lawsuit against Paul Forest. And this is one of the first known legal proceedings in the case of plagiarism. 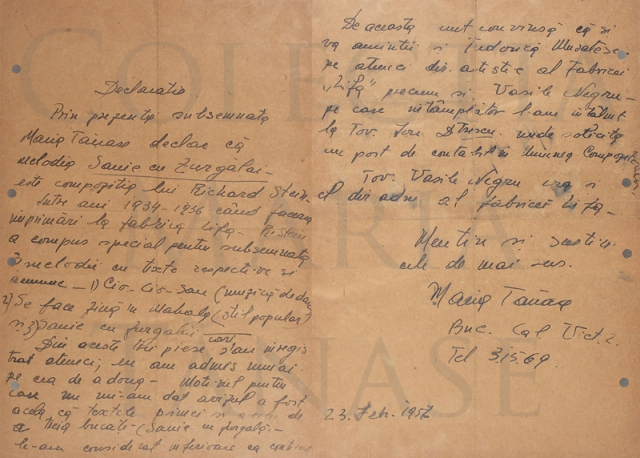 Thanks to a document written personally by Maria Tanase, that this song was composed by Stein specially for her in the period 1934-36 the court restored justice and the true authorship of the song. In 1988, the Belgian band Vaya Con Dios released a cover version “Johnny, you’re not an angel” with the authors from Edith Piaf’s CD: Les Paul and Francis Lemarque. In July 2001, nine years after Stein’s death, the UCMR-ADA (Union of Romanian Composers and Musicologists – Copyright Rights Association) initiated a process to protect Stein’s copyrights. In addition to the above versions, there were also “Johnny, you do not know me” in Russian; “When the first snow falls” in Serbian; “Fire and wind” in Hebrew and Yiddish. There is a Soviet interpretation of the hit “Johnny”. Alexander Kovalenko performed it, the words were written by the poet N. Doriso in 1955. In 1969, the Israeli duo of Esther and Avi Ofarim performed the version in Romanian. Let us note performance of this song in 1985 by the remarkable Moldovan ensemble “Orizont” under direction of Oleg Milstein. It was indicated as a Moldavian folk song. Fate was again unfair to the author. 2017: The song “Gul әpshe” of the Kazakhstan boys-band “Alau” is rapidly gaining popularity on the Internet. A well-known hit, in the destiny of authors and its own fate events of the 20th century were reflected, continues its march all over the world. Richard Stein was born in the town of Roman (Romania) on June 13, 1909 in the family of a commercial bank branch director. Roman of that time is a provincial city with a vast old park and a small hill where military fanfare on Sundays performed Strauss waltzes. Lake with boats. Two cinemas “Modern” and “Trianon”, two hotels, two restaurants. Since childhood, Richard studied piano and violin. From 1923 to 1925 he studied in Bucharest, then at the Paris Conservatoire. In 1936 he became director of the Efori Theater in Bucharest. From 1937 to 1939 he was the music director of the disc house Columbia, worked as a teacher in the Jewish lyceum. 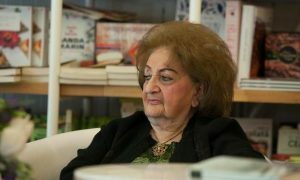 Antonietta Ralyan (nee Stein), translator of the English literature, Rihard’s younger sister recalled: “… what I remember from my childhood is that music lovers gathered at our house and Richard and his colleague Sergiu Selibidakh gave a jazz show on two pianos”. During the war he was interned in a labor camp, after which he taught music in the lyceums of his native city. 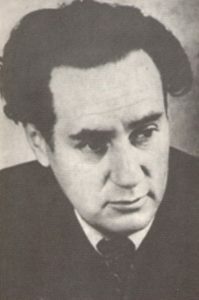 In the years 1950-1953 – conductor in the theater “Ion Vasilescu”, since 1956 – member of the Union of Composers of Romania. Stein is the author of a large number of works on verses of famous poets. The song SANIE CU ZURGĂLĂI, written in the words of Liviu Deleanu brought him the greatest glory. Stein died on November 20, 1992 in Bucharest. Liviu Deleanu real name Lipa Kligman was born in Iasi (Romania) on February 8 in 1911. In Iasi, Kligman-Delyanu studied in a heder and in a Romanian gymnasium. In 1927 he started working for the journal Vitrina Literară (Literary Showcase) and took the pseudonym Liviu Deleanu, at the same time he published the first poetic collection “Oglinzi Fermecate” (Magic Mirrors). In 1928, Deleanu continued his literary career in Bucharest. He published translations from Yiddish and fragments of his own novel. 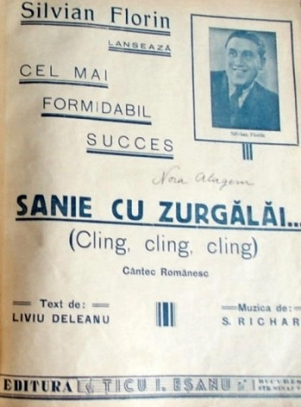 Some poems of Deleanu became famous songs, including the romance “Sanie cu zurgălăi” (“Sledges with bells”). After annexation of Bessarabia by the USSR, Deleanu moved to Chisinau. During the war he lived in Moscow and translated the Russian poetry into Moldovan. The poet’s parents perished in 1941 during the pogrom in Iasi when more than 14,000 Jews of the city were killed. Impressed by this news, he wrote a poem “Coşmar” (Nightmare). In the last months of his life, Deleanu finished the “Book of Desires”. He died on May 12, 1967. In Chisinau there is a poet’s house-museum, a monument and a memorial plaque, Lyceum named after Liviu Deleanu and the street with the same name. Since childhood Paul has shown interest in radio equipment. Professional career began in the early 1930’s: he played folk, jazz, blues, country, and Hawaiian music. In 1941 he independently invented the first electric guitar with a solid body. During the Second World War, he was drafted into the radio service of the US Army. Then he worked in Los Angeles studios as an accompanying guitarist for various performers (Bing Crosby, Jack Benny, etc.). He became a famous guitar virtuoso, a songwriter, and an innovator in the field of sound recording. Paul was one of the first to experiment in the field of sound imposition. The first solo records in 1948 – “Lover” and “Brazil” – became the result of experiments with magnetic sound recording. In the 1950-1952 Les Paul at the invitation of Gibson participated in the electric guitar development, which received his name – “Les Paul”. Gibson Les Paul has become one of the most popular guitars among the rock musicians. In 1948 he began to work with singer Iris Colleen Summers (stage name Mary Ford), who became his wife. The duet’s albums were composed of songs performed by Mary Ford and instrumental compositions, while Ford also played the guitar. Composer Richard Stein sued Paul, accusing him of plagiarizing the song “Johnny is The Boy for Me”, borrowed from “Sanie cu Zurgălăi”. 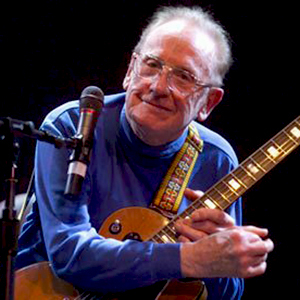 In 2006, Les Paul received two Grammy Awards for his album American Made World Played. He is one of the few musicians who has a permanent exhibition in the Rock and Roll Hall of Fame. In 2007 he was awarded the National Medal of the USA in the field of arts. Les Paul died on August 12, 2009.